Château de Mazan is the former residence of the Marquis de Sade, an 18th Century French aristocrat, politician and writer who was infamous for his outrageous, libertine lifestyle. 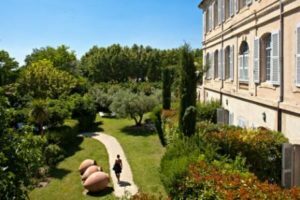 His stunning Château is an ideal destination for a relaxing and pampered stay and an ideal base from which to discover the delights of the Southern Rhône and Provencal wines. Frédéric and his friendly team will be on hand throughout your stay to ensure an enjoyable and peaceful break. The Château is located within its own walled grounds in the quaint town of Mazan, at the foot of Mont Ventoux. It is within easy reach of the fascinating city of Avignon and the prestigious Châteauneuf-du-Pape, Gigondas and Vacqueyras appellations. Also nearby is the stunning Luberon National Park. Guests at this elegant and historic Château will truly experience deepest Provence in the beautiful landscaped gardens with its incomparable scents of the region’s vegetation. For ultimate relaxation, guests can doze in the shade of the mulberry and centenary olive trees, take a dip in the outdoor pool or enjoy a cool drink in the Château’s retro bar. Inside the main building, the ceilings are high and all of the public areas are delightfully cool and impeccably decorated. There are 25 rooms in the Château itself and an additional 5 rooms in the Provencal mansion. Each en-suite room has been designed with a personal touch, uniting comfort and charm and is equipped with a mini-bar, a safety deposit box, a telephone with internet access, air-conditioning and a hair dryer. Various room grades are available, from cosy Charme rooms to luxurious Suites.